Leptin in vitro SimpleStep ELISA® (Enzyme-Linked Immunosorbent Assay) kit is designed for the quantitative measurement of Leptin protein in mouse serum, plasma (citrate), urine and cell culture supernatant. Leptin is a secreted protein factor produced by adipocytes. It regulates energy balance and body fat deposits. Leptin deficiency in humans and mice can cause obesity. Circulating levels of Leptin are regulated by food intake, insulin levels and pregnancy status. Mouse leptin has 96% and 85% protein sequence identity to rat and human leptin, respectively. Our Abpromise guarantee covers the use of ab199082 in the following tested applications. Example of Leptin standard curve. Interpolated concentrations of Leptin in mouse serum and plasma (citrate). The concentrations of Leptin were measured in duplicate and interpolated from the Leptin standard curve and corrected for sample dilution. The interpolated dilution factor corrected values are plotted (mean +/- SD, n=2). The mean Leptin concentration was determined to be 4514.3 pg/mL in mouse serum and 2698.1 pg/mL in mouse plasma (Citrate). 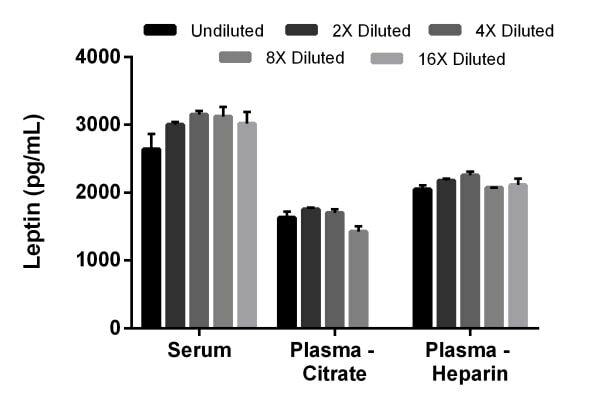 Interpolated concentrations of Leptin in rat serum, plasma (citrate), and plasma (heparin). The concentrations of Leptin were measured in duplicate and interpolated from the Leptin standard curve and corrected for sample dilution. The interpolated dilution factor corrected values are plotted (mean +/- SD, n=2). The mean Leptin concentration was determined to be 2983 pg/mL in rat serum, 1626 pg/mL in rat plasma (citrate) and 2134 pg/mL in rat plasma (heparin). There are currently no Customer reviews or Questions for ab199082.